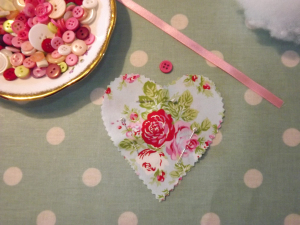 Here is a tutorial to make two of our little fabric hearts. It is a comprehensive step by step guide to help you on your way if you have never made anything like this before. Our kits contain everything you need, so don’t worry about having to buy any extras! 1. Pin together with wrong sides facing. 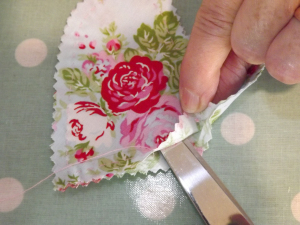 Tie a knot in your cotton and bring your needle up through from the wrong side of the fabric to start your running stitches. 2. 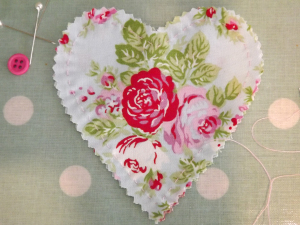 Stitch around the heart approximately 3/4 cm in from the edge. 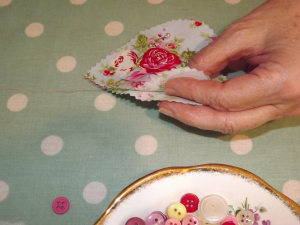 Remembering to leave a gap at the end so that you can fill your heart with fibre filling. 4. 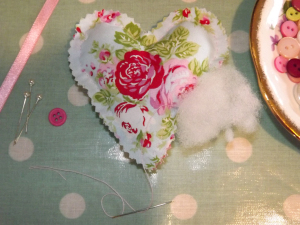 Continue your running stitches until the heart is sewn together & cast off.